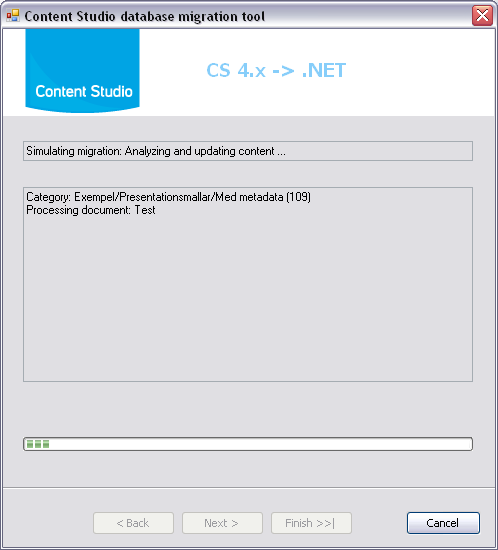 The Content Studio migration tool will assist and do most of the job when migrating from version 4 (ASP and VB-script) to version 5 (ASP.NET and VB.NET). 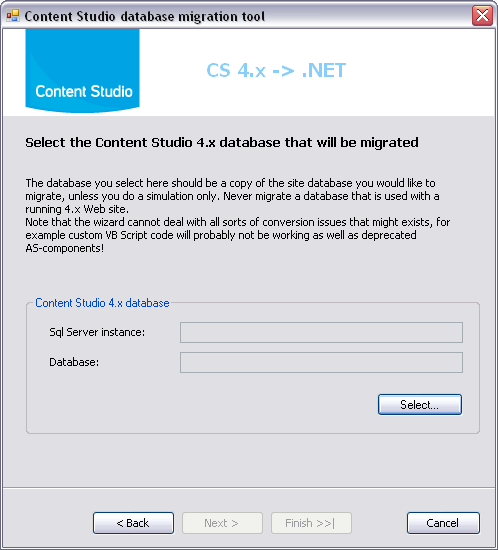 More details on migration are found in the article Migrating to Content Studio 5. 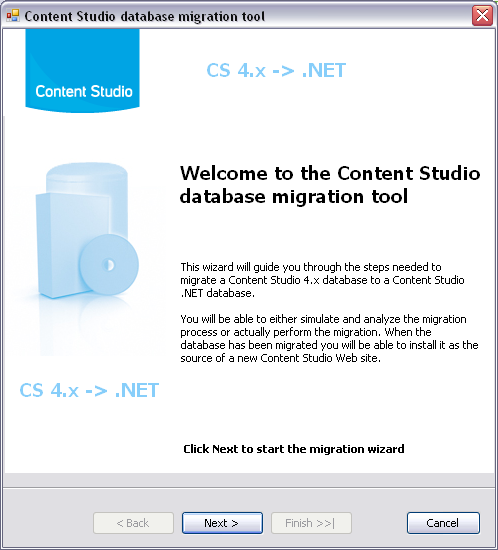 The Content Studio Migration tool is available for all customers and can be downloaded at Content Studio web page. The migration tool can be run on any computer running Windows XP, Windows Server 2003 or later. For Windows XP and Windows Server 2003 you must have the .NET Framework 2.0 installed and it is recommended that the framework is updated to the latest version. Copy the downloaded content, including the Data sub directory, to a directory of your choise on your computer. In order to run the program you must be have db owner permission on the site database to analyze or migrate. On Windows Vista where user account control is active (default) and your Sql Server is located on the local computer, you might need to check that your windows account have the necessary permissions in SQL server even though that you are logged in as a account with adminstrative privileges. Since a process that you start by default does not run with elevated privileges you cannot rely on your membership in the local administrator group since these rights are stripped off from your login token. Instead you might be able to run the Migration tool with administrative privileges or explicitly add your login to Sql Server and set it as db owner of the site database. 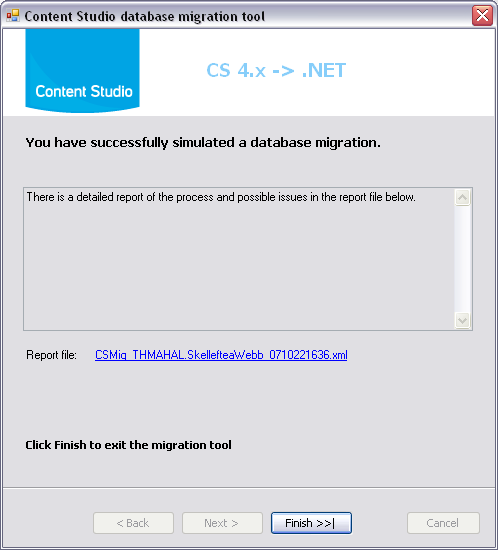 Start the migration tool by double clicking on the CSMigrationTool.exe file. Now you will see the following welcome screen. In the next step you need to select the database to analyze or migrate. 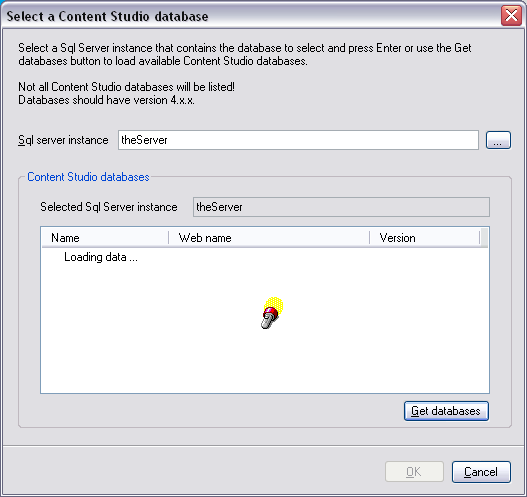 Only Content Studio 4.x.x database can be used. By pressing the Select button the select database dialog appears and assists you when you select the database to migrate or analyze. Perform all the configured content replacements. Checks for all occurences of outdated AS components. All occurences found will be logged, but no data will be changed. Checks for all occurences of custom AS components. Script block server side code. This is the recommended level that will server most users. This setting is inteded for users that would like to have information about most details. The reporting file generated is often serveral times bigger than the file generated by Normal level. The same info as the Extended level is written to the report file but on an extremly detailed level. This setting is inteded when there is a need to detect problems with the program. 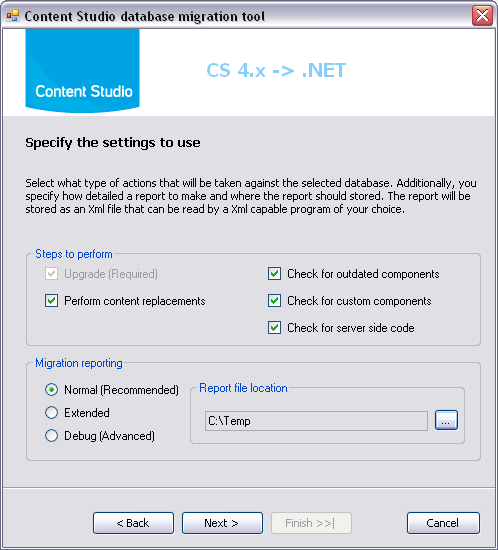 The reporting file generated can be very large and difficult to read for normal programs. This alternative allows you to select the directory where the reporting file should be stored. Before you can continue you must choose a reporting location. Before starting the actual process you can select whether to migrate or just simulate and analyze the migration process. By default the tool is set to just analyze the database and simulate the migration process rather than actually perform it. This makes it possibly to test the process and get the report before any migration is done something that radically facilitates the often difficult task of estimate the work and time needed for a CS 4 to CS 5 migration. If you uncheck the Simulate only checkbox you will start a true migration process in the next step. Before the tool allows you to start you will need to verify that you have a valid backup and that the database is not in use by a running website. Never run the real migration process on a database that is in use by a running CS 4.x Web site. The database will be upgraded, data will be changed and the Web site will stop working. Make sure that you have a recent valid backup of the database before starting the migration process. If anything goes wrong you must be able to restore the database to its original CS 4.x state. This is especially important if you have your own replacements done. For more information on how to customise the replacement and scan process see the section Customizing the migration tool below. During the actual migration process you can follow what is going on in the status window. Detailed messages are not shown here but logged to the report file so you can see them afterwards. The last step shows a summary of the analyze or migration that has been done and alsow allows you to directly open the generated xml report file by clicking the link. The report file has a consistent schema that makes it possible to open with for example Microsoft Excel and filter the data as you like. The sample below shows that the xml report file is made up of a series of report items that either display some sort of information, a compatibility warning or a breaking error. The idea is to separate the entries in groups that probably will have the following impact on your web site. Impact: Will probably not work but a workaround exists. Impact: Will not work and the page or component must be rewritten, or, the functionality is no longer supported. The generated report together with a manual analyze of the site structure and the content in general can be used when you estimate the amount of work that needs to be done to get the web site working in the new environment. mandatory:       true if the scan is mandatory, for future use only. case-sensitive:  true if the searchcondition is case sensitive, false otherwise. replacements:    The replacement string that will replace the text find by searchcondition. description="Replacing .ASP with .aspx" mandatory="true"
level:           can be 0=Information, 1=Warning or 2=Breaking. description:     A description of the scan to be performed, for debug logging mainly. searchcondition: A regular expression to be used to find matches. message:         A message to be written along with the document id and name if any match was found. findAll:         (true, or false) optional, searches for all occurences that matches the searchcondition. displayContent:  (true or false) optional, writes the content of the matches to the reports data field. of the sought after component. grouped with a delimiter between them where the node name is indicated. message="The document contains the &quot;Insert script&quot; AS-component which might contain incompatible code." As you can see in the excerpt from the config.xml file, you can provide your own replacement and scan operations that should be executed during migration. Before you run the program you must be sure that your regular expressions work exactly as expected and that there in not syntax error in the file. As always it is a good idea to always have a working copy of the config.xml file that you can use in case something goes wrong. Please examine the file to see how we have done it and what actually is going on under the hood. The example above shows the configuration for a replacement operation and a code scanning operation where all the occurences of inline code blocks are found and the content of these script blocks are written in the report. The third example searches for all occurences of the Insert Script component and uses an XPath query to retrieve the code content of the Script parameter in AS component Xml source. It can be very complicated to edit existing configurations or add new replacement or scanning operations. Even the slightest mistake will make the Migration tool useless and custom configurations requires thorough knowledge of Regular expressions and XPath expressions.